First things first. Last week I saw a request to send in unique pictures to one of the Fox News guys. So I sent one of my favorite pictures. Sure enough they agreed and posted it on the website. The link should take you to it. The photo is much more than a picture of Matthew and the soldiers. It reminds us of a great adventure traveling to Germany. Traveling with an autistic person can be a real challenge. I’ve written about past trips. We have learned to expect delays and deal with fatigue and impatience. For our family the benefits of travel outweigh the difficulties getting there. But we know of families whose child’s behavior outside his comfort zone is too erratic to chance an air trip. Even though Matthew is almost 28 he looks young. And sometimes he acts young too…like the day while back in the store and, for whatever reason, he wasn’t happy. Though I tried not to make a scene another shopper thought I was manhandling him and took it upon herself to chew me out threatening to call child protective services. For our friends with “normal children” the teen years presented many challenges. We went through many of the same issues but imagine them compounded by difficulty communicating. Actually, come to think of it, maybe it was better that Matthew wasn’t able to call me names or say some of the things I’ve heard other teens say to their moms. The good news is that everyone eventually outgrows these years. The autism spectrum is huge. It runs the gamut from being non-verbal and totally introspective to minor problems when dealing with social situations. Depending on the severity these adults may be able to live independently, complete college, and fit into society without too much difficulty. Severe autism, such as Matthew has, does limit many opportunities. Thankfully, we are no longer in times where everyone who gets such a diagnosis is sent to an asylum. Our family chooses to push Matthew’s comfort zone to the edge and in doing so we hope that with his horizons expanded he can live the best life possible. There is no point to my ramblings today except to share a little insight so that your next encounter with a special needs person might be a little more smooth. Oh, and the picture is Matthew hanging up his swim towel. 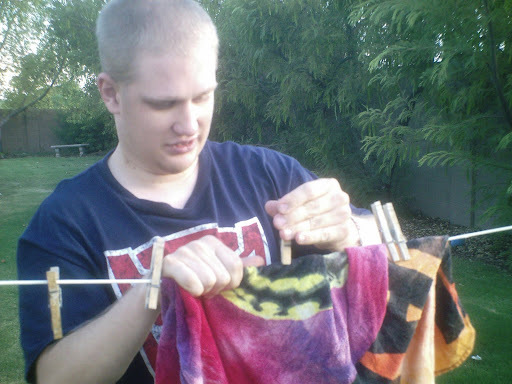 He is of the firm belief that if two clothes pins will hold it then ten will really keep it on the line.